Oscar has struggled with several skin issues since we first brought him home. Oscar not only had mange, but he’s also had two staph infections on his skin. Although his major skin issues have been treated and have healed, we still try to take care of his skin on a daily basis to prevent future problems. Oscar excited about his coconut oil treat. Even if a mini pig doesn’t have mange or any skin infections, dry skin is a concern for most pigs. We try to keep Oscar’s skin from getting too dry in a few different ways. We try not to bathe Oscar unless it’s absolutely necessary since bathing can dry out a mini pig’s skin. This is easy since he hates water anyway! Instead, we just wipe him down with a damp towel every few days to keep him clean. We also brush him gently but regularly, which helps exfoliate his skin and control skin flakes. Another way we try to keep Oscar’s skin healthy is by using lotion and sunscreen. We have tried lotion, baby oil, and coconut oil on his skin, and all seem to work well depending on your preference. The trouble with external lotion and oils is that I had trouble getting them underneath his hair and onto his skin. Also, Oscar likes to cuddle, so sometimes I would oil him up and then he would settle in to cuddle, getting the oil all over me. It also makes him slick depending on how much and what type of lotion or oil is used, so I have a hard time catching him when I need to! 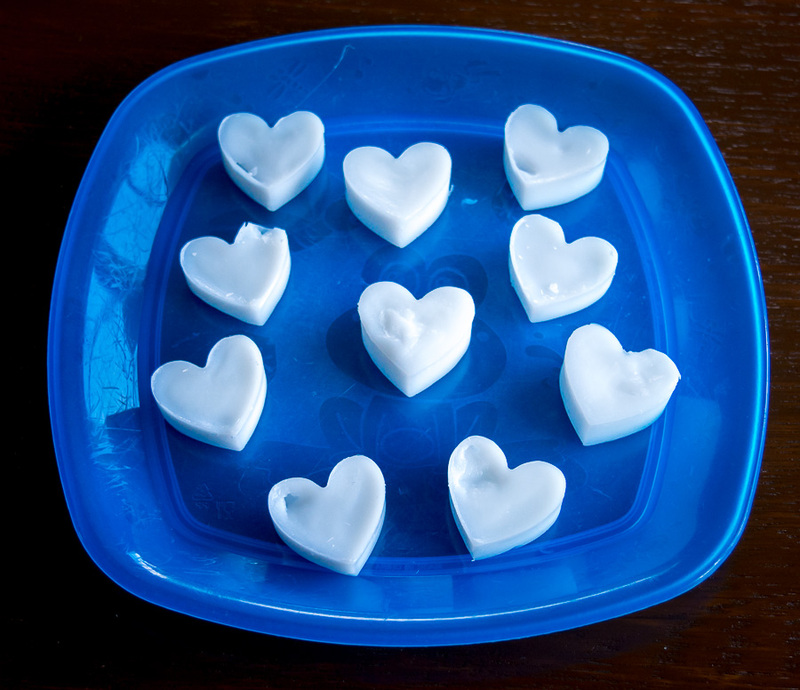 Frozen coconut oil in the silicone mold. I still use lotion and sunscreen when necessary, but I came across a much easier internal solution that I use on a daily basis now to keep Oscar’s skin healthy: coconut oil treats. I got this idea from the awesome Peony the Pig and her mom, Lauren, and it’s quick, easy, and Oscar loves it. 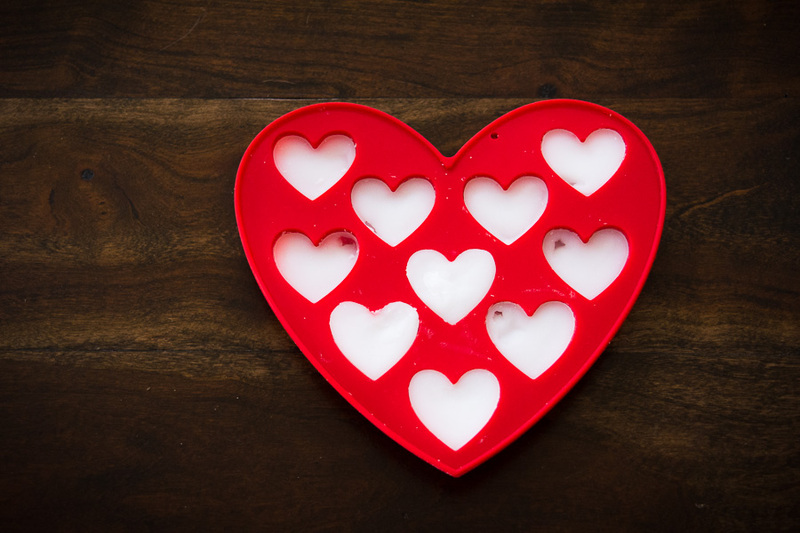 The basic idea is that you heat coconut oil, put it in a silicone ice cube tray, put the tray in the freezer until frozen, pop out the frozen coconut oil treats, and give one to your mini pig daily or every other day as a treat. The oil helps keep your pig’s skin healthy from the inside out, and it’s easier and faster than external lotions and oils. I make Oscar’s treats out of Spectrum Organic Unrefined Coconut Oil since that’s my preference, but it’s definitely not necessary to use that specific kind. Peony’s mom made a quick and helpful video on how she makes coconut oil treats, and she also listed detailed instructions in text next to the video, so definitely check it out if you’re interested in making coconut oil treats for your mini pig. Watch Oscar eat his coconut oil treat. He loves them! Finished coconut oil treats. I crush them into smaller pieces and give him the equivalent of 1/2 to 1 treat each day to help with his dry skin. I put Oscar’s frozen coconut treats in a ziploc bag and then smash them into smaller pieces to add to his salad or his meals each day. He gets super excited about them, and his skin looks great these days. The coconut oil treats, combined with his brushing and occasional lotioning and sunscreen, seem to help keep his skin healthy and less dry. If you haven’t checked out Peony the Pig, I highly recommend it. 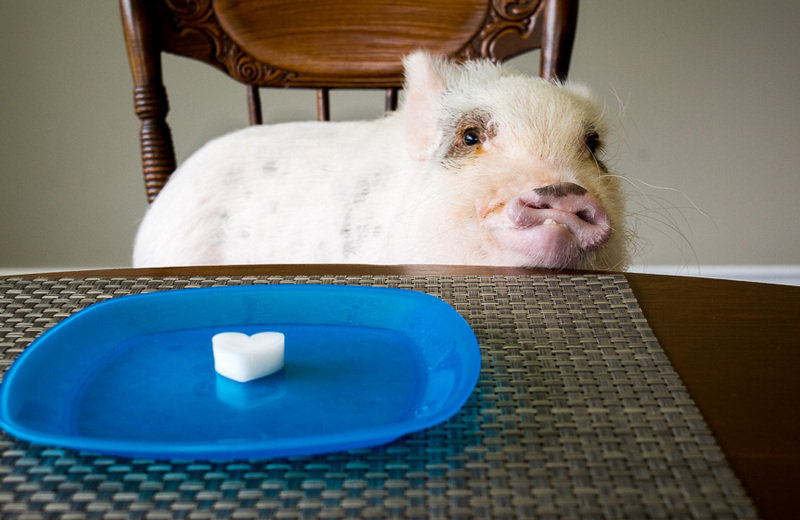 Not only is she an adorable, happy pig, but she and her mom have an awesome website, PeonythePig.com, where they feature outstanding pigs with interesting stories. 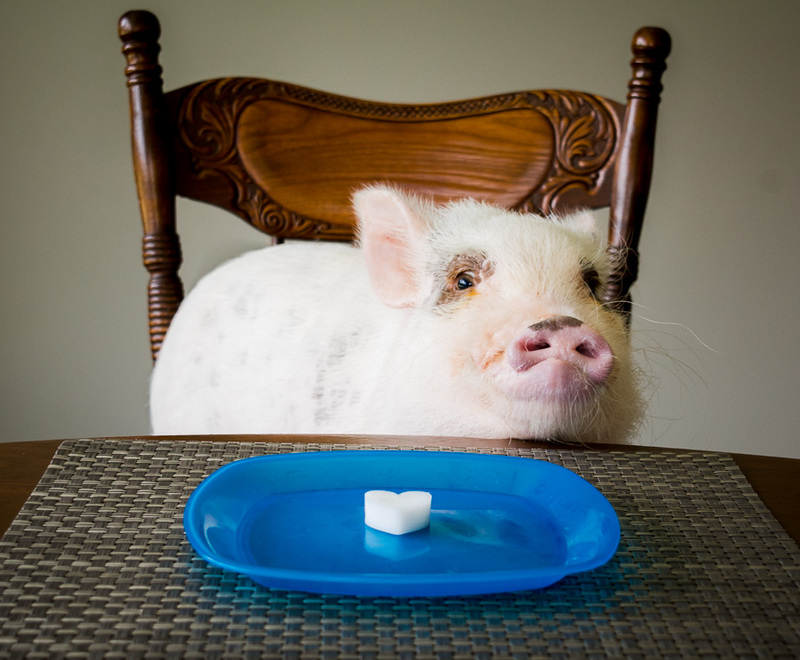 It’s a great place to learn about other pigs and their families in an interview-style format. Peony and her mom ask questions that other mini pig parents will find very useful in learning about how other pigs and their parents live day to day. Definitely check it out! Aaaaawe!!! Thanks for the shout out! We love you guys!!! Look at Oscar eyeing that treat…haha. This is a good idea. I’ll have to try this. Elmer has dry skin too. I’ve never bathed him because he hates water and he doesn’t smell, so, I don’t feel the need to. I heard flaxseed oil is good, too. Can I put people lotion on a pig? Hi Donna! I don’t know what’s technically correct to put on them, but I believe you can. I tend to stick to oils for Oscar, and I’ve used mainly baby oil and coconut oil. He’s a little greasy for a while (which is why I tend to prefer the coconut oil treats), so I go pretty light when I apply the oils to his skin. Also, he’s really hard to catch if he gets loose in the yard after I’ve just put oil or lotion on him…haha! I use baby lotion and home made lotions on my guy. He does mind it at first but then he settles in and lets me rub it all in good. I also do the frozen coconut treats. Although mine are not so fancy. I just scoop up an amount and put it on wax paper then into the freezer and when frozen into a baggy for easy access. Aloe is supposed to be a good lotion or coccobutter lotion. We also feed and rub ours down with coconut oil unrefiened. I use Aveeno baby lotion on my piggy, Ellie Mae. It’s not greasy and helps with flaking skin. I’m definitely going to try the coconut oil treats. Thanks for sharing what you use, Jodi! Hope Ellie Mae likes her coconut oil treats! Please be careful…my 4 year old pot-belly was pretty dry, and a so-called expert told me that coconut oil was the answer. After two weeks his skin became infected, he lost all of the hair on his back, and he was so miserable that it was a family ordeal. It took MONTHS to get his skin healthy again…and again his boy is a strong, healthy pig who has few issues…but Coconut Oil almost killed him. What type of brush do you use on Oscar? Hi Cyndi! I don’t have a great brush for Oscar. I have a few I use that work okay, but I don’t have one that I’m particularly excited about. I have one of those rubbery Kong Zoom Groom brushes and a cat brush I got from the store that has a rubbery, nubby side and the little metal-looking spikes on the other side (not sure how to describe it obviously…haha). I like the cat brush the best because the rubbery side feels nice to Oscar and gets some of his loose hairs out, and the other side helps scuff off some of his dry skin (although I have to use this side gently on him or he doesn’t like it). I’m guessing there are probably better alternatives out there, but that’s what we use at this point. Hope that helps! I make the treats, but add alittle dab of peanut butter in the tray of coconut oil, then freeze & my piggies love them. Do you give him and entire heart of coconut oil or do you give him a piece of one everyday?